The Huddle Smartable™ Intensive Support Table marks a milestone in modern learning environments. No longer are Teacher Tables intimidating stations placed at the front of a classroom. 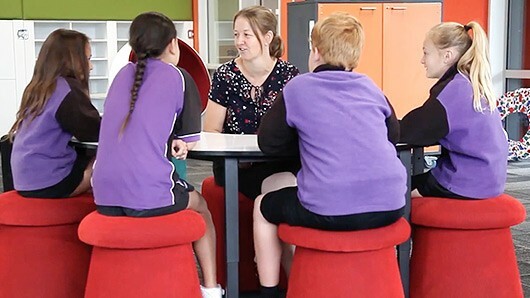 Huddle is designed for a Teacher to sit at the inner curve of the table with students around the outer curve. At this central location, the teacher can easily assist and support each of the students at the table. Add single seat ottomans, student chairs or even curved ottomans around the outer curve to offer comfortable seating for students. The Huddle Smartable™ is perfect for intensive teaching. This table is ideal for accommodating students with special needs that need extra attention and learning support. Arrange versatile ottomans like the Cushox Round around the outer curve to create a focused yet playful support space. BFX Furniture's SmarTable™ range offers unique flexibility in that they can be adjusted to 5 different heights and easily wheeled around classrooms on their wheels. Making re-arranging desks and chairs easier and more fun! To change heights, simply engage the push button mechanism and slide the legs until you reach your designed height. The Huddle SmarTable™ Intensive Support Table is available with a whiteboard finish. Draw, doodle, explain and unpack ideas using whiteboard markers then simply erase when finished. Students love using whiteboard tables because they offer a smooth surface to map out ideas without the mess and fuss of paper and notebooks. Available in a wide range of our best-selling education board finishes. Mix and match vibrant colours or create a contemporary colour palette in earthier shades. Talk to one of our Expert Sales Consultants to arrange for some swatch samples to be brought to you or simply order your samples online. The tabletop is sturdy and able to withstand a heavy load capacity thanks to the structural integrity of its high tensile steel frame. Rest assured knowing BFX tables are built to last and built to withstand the most demanding classroom environments. 18mm top with unique curved design and plenty of workspace. 2 x 50mm castors ensure easy transport around the space. Adjustable to 5 heights, 520H, 580H, 640H, 700H, 760H - allowing students to set the table to their ideal height. Can be adjusted by a student without tools making it easy for quick readjustments.